So I’ve reached week 2 of my in-home vacation (i.e. the first real break of the summer for me) and it’s going great. So great that I’m not really accomplishing anything that I need to. But I’m letting myself sit back and relax because who knows how relaxing grad school will be. (smile) So what have I done since Saturday? Well, Sunday morning I woke up super early (ok, I realize 7:30 am isn’t that early, but for a weekend it is!) and rode my bike downtown to practice yoga at Uttara. The ride was wonderful because no one was out and about yet, and although it was the first time I’d practiced in a long time (read: two years), the pain and effort were worth it. My instructor, Shannon, was really helpful with her hints, and the class size (only 5 people) made it easy for me to center on my positions and my breathing. The studio, Uttara, is one of the most beautiful and peaceful yoga studios I’ve ever practiced in: second storey of an old brick building downtown, windows all around, light-filled, beautiful view of the city and mountains. I’m hoping the schedule stays the same because I’d love to make this a part of my routine. Other vacation activities include meeting up with bike folk and riding around town Sunday evening (I now know how to bike to Target! ), watching really bad chick flicks on Netflix streaming, and riding down to the Grandin Theater last night to watch Julie & Julia (finally!). The movie really was as good as everyone said–Meryl Streep’s impression of Julia Child is spot on, and, I’ll admit it, I totally got teary eyed with the two couples (Julia & Paul, Julie & Eric) in love and their food-centered life. I can’t remember exactly what the quotations were that set me a’cryin’, but if someone ever said they loved me using cooking-centric words I’d melt on the spot. Melt. Like butter, or Earth Balance, I suppose. Before I went to watch Julie & Julia, however, I cooked up a darn good dinner. If only I’d had a Paul Child to share it with… Anyways, I whipped up some basil polenta, garlicy swiss chard, and sauteed chicken of the woods mushrooms. The chicken of the woods mushroom is incredible! It’s chickeny–no really, it is. The texture is exactly how I remember a chicken breast and the taste is completely convincing–even my omni roommates agreed. I slightly seared the mushrooms in olive oil and didn’t do anything else to them–this preparation left them a bit on the dry side. If I were to do things differently I would make a reduction of red wine or balsamic vinegar and drizzle that on top of the plate. Just a little juice would help. I’m hoping to find the mushrooms again at the farmers market this weekend because I’d love to play with them some more, but who knows what the vendors will have on hand. But really, you’ve got to find some of these shrooms–they are everything I’ve been missing in life! In a medium sized sauce pan, bring the water and salt to a boil. Slowly stir in the polenta/cornmeal and reduce the heat to a simmer. Stir every 5-7 minutes to eliminate clumps and simmer for 30 minutes. Remove from heat and stir in olive oil, basil, and pepper. Set aside. In a saute pan, heat the olive oil over medium heat until warm. Add the mushrooms. Cook 4 minutes on each side until lightly seared and tender. Remove from heat and set aside. In the same saute pan warm the remaining teaspoon of olive oil over medium heat. Add the garlic and saute for 1 minute. Add the chard stems, saute for 2 minutes. Add the chard leaves and saute for 4 minutes or until tender. Great way to use the mushrooms! i need to find me some of those mushies! 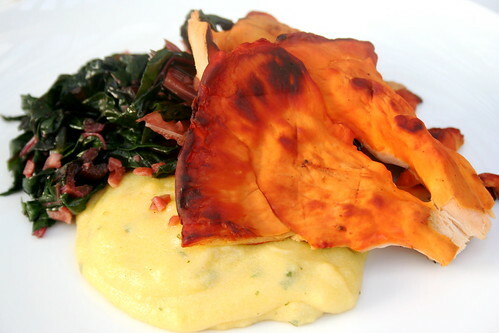 i love your combination of basily polenta with the garlicy swiss chard! mmmmmmm! uttara sounds like such a lovely place to practice yoga – and hooray for a great class! bike rides, cheezy chick flix, and veg’n out are my kinda vacation timez! w00t! Mm… I’ve been seeing polenta EVERYWHERE! Must make now!! And those mushrooms are so interesting looking… I always steer clear of the mushrooms stand at my Farmer’s because I’m afraid of them being expensive and me having to turn around sad empty handed… haha… I might have to work these into the budget though! Nom Nom NOM!! … oh yeah… have you seen “Stranger than Fiction??? I LOVE that she’s a baker so he brings her “Flours”… AWWWW… anyhow your wonderful weekend and movie outting made me thing of that! Enjoy the time off! Delicious! They do all sorts of mushrooming around here, but we’re too chicken to get out there. Oh well: there are stores (and they know what they’re doing). This looks so great! Going to the market tomorrow to pick up some of these goodies. I don’t know if I am brave enough to actually try them, but do I have to use really young ones (because the ones you show look a bit like an advanced stage)? oi, I wish my gran were here, – I bet she’d be as excited as I am now! This is a recipe for which Julia would be proud, Jes! I’ve found these mushrooms at the Rhinebeck Farmers Market. Awesome combination! Wow, wow, wo! I didn’t know mushrooms which grow on trees were edible. But after some research and looking for the German translataion I realized that the “Chicken of the Woods” is listed in my mushroom book. It clasifies the mushroom as “edible with some limitations” and tells me only to eat young mushrooms. In German it has the word “sulfur” in it’s name. But I think that refers to the colour only. I am so looking for this next time I go mushroom hunting. And then I make your recipe. Thanks for this recipe! I found it (and your blog) frantically Googling to try to figure out what the heck to do with some chicken of the woods that I bought after my mushroom guy gave me a stern warning about how “you need to cook them in a lot of liquid first” and “a lot of people don’t like them!” and “some people are allergic to them!” I subscribed to your blog in Google Reader and I’m looking forward to reading more.